Wix has its own eCommerce system that lets you add a beautiful, customizable online store to your Wix website. Wix eCommerce is quite flexible: it supports multiple payment methods like PayPal and Webmoney, lets you import your entire online store to Facebook and enable various eCommerce-related applications, such as Gift Cards, Sellfy (an app allowing to sell downloads) and more. Wix online shop comes as part of the Wix’ ‘eCommerce’ and ‘VIP’ Packages ($16.50mo – $24.50/mo; billed annually). Besides reviews, there’s another great method to see and feel how Wix eCommerce really works – view Wix eCommerce examples. Thankfully, the builder showcases its clients’ works on their official site so that you can easily browse through them. Drysteppers.com is a web store offering a collection of dry steppers that will protect your shoes from moisture and mud on a rainy day. The web store is logically-structured, featuring several menu points that completely reveal the website indication. Intuitive and simple navigation, an image slider providing the products available for sale, customer reviews and a video giving the insight into the universal nature of dry steppers make the online store worth visiting. You can also browse the FAQ section and reach social network accounts of the web store to stay aware of the recent collection updates. For those users, who are interested in details of the shopping process, the website offers an opportunity to sign up for a newsletter or get in touch with the team by filling out the contact form available at the bottom of the home page. 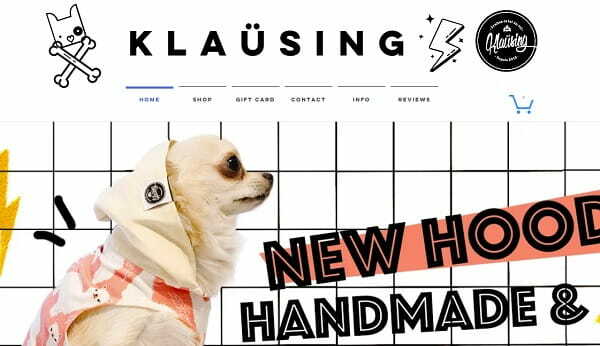 Klausing.club is quite an unusual web store of original clothing and accessories for dogs. Website design absolutely comes up to its niche specification. There are lots of funny cartoons and images that vividly stand against the white background to draw user attention. A large image slider offering the most popular models is the very first thing a user sees when visiting the website. There is the CTA button here, which redirects you to the web page with the products you are interested in. Social networking icons are available here as well. As you scroll down the page, you will come across new product arrivals, newsletter sign up field, shipping and returns info, shopping terms and conditions. If there is still something you doubt in, you can get in touch with the customer support service via the Let’s Chat pop-up window, where you can type your question to get a quick answer. 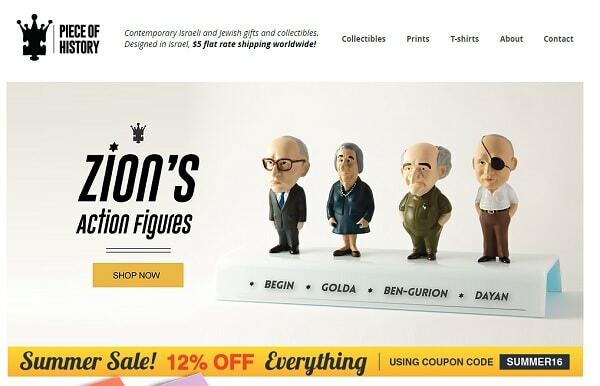 Established in 2009, Piece-of-History.com is a Tel-Aviv-based design studio focused on creating history-related toys, prints and T-shirts. The main goal of the studio is to create cool, modern gifts that take Israeli and Jewish folklore to a new era. Although the website accommodates a lot of content, it looks clean and nice. In terms of design, the timeless black-and-white color scheme is used giving an impression of minimalism and elegance. The slider on the main screen is certainly eye-catching – I watched it three times. It is accompanied by the promo code below, which is a good marketing trick aimed to engage website visitors into selling process right from the start. Bûcheboard.com is the online store, which triggers user interest from the very first moment you get to the homepage. The full-screen image of a Butcherboard – the eco-friendly wooden skateboard used for seating and entertainment purposes – looks intriguing and causes an urge to keep browsing the gallery right from the start. Website design is pretty simple and understandable. You won’t find any distracting or unnecessary content here. All the info a customer needs to find out about the product is provided in the main website sections, including About, Gallery, Collaboration, Contact/Buy and Workshop. The latter section deserves individual attention as it provides the photos of the main steps of the Butcherboard manufacturing process. The color scheme of the website is light and pleasant, with high quality colourful photos effectively standing out against the white spacious background. 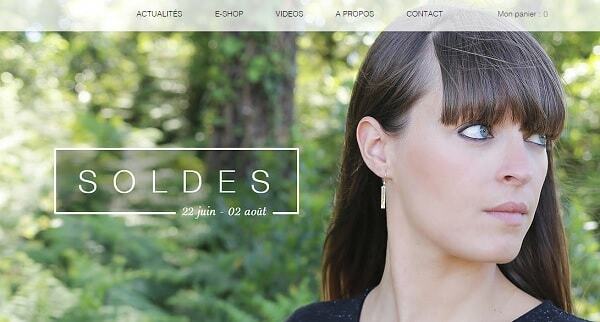 The website is available in the French language, which gives it style, visual appeal and unspeakable chic. 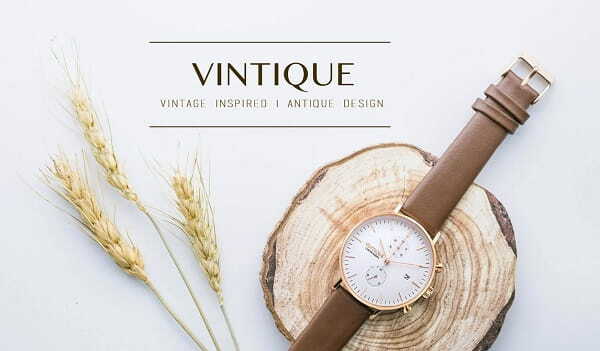 Vintique-Watch.com is the web store of vintage-inspired watches with antique design. The website creates pleasant impression and encourages a user to browse the product catalogue to see what it has to offer them. Light colour palette, prevalence of white colour creating the atmosphere of space and comfort, minimal use of text and abundance of high quality photos of watches that speak louder than words give the website stylish, graceful and contemporary look. The most exquisite watch models are provided directly at the home page, while the “View Full Collection” button redirects to the catalogue of watches offered for sale. Those users, who wish to get in touch with the web store team, can do that by using the contacts or filling out the contact form. If you wish to be informed about the new catalogue updates or shop news, there is an option allowing you to join the mailing list and get the required info on time. A successful sample of a Wix-based eCommerce website! Example 6: The Original Tea Towel Co.
OriginalTeaTowel.co.uk is a family-run business that produces and sells a wide range of tea towels, including the ones with personolized prints. 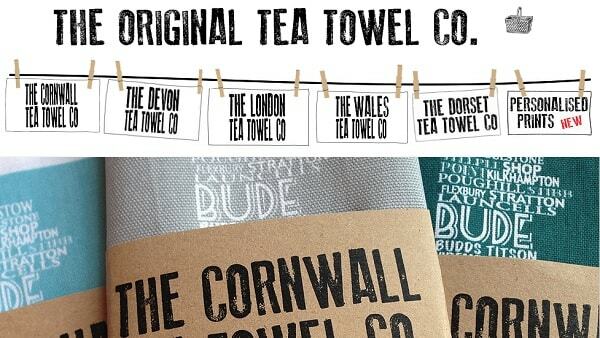 With a story behind the brand, the tea towel becomes more than just a piece of cloth. I must say that the owners of the website are doing a great job at highlighting the original idea behind their products and here’s why. This website can be a perfect example of how you can build your eCommerce website using Wix. The first thing that catches attention is the creativity of the top menu, which is visualized in the form of tea towels that have been washed and hung along the line to dry. Each tea towel (menu entry) represents a manufacturer and takes the user to the corresponding catalog. The bottom menu finishes the composition as the menu blocks use the same font and style. Bensimonboutique.com is a Wix-powered eCommerce website that is founded and owned by Tanya Hamersfeld, who comes from a family of jewelers. The design of the site reflects its essence and mission – selling contemporary jewellery with a playful twist. Just as each piece of jewellery displayed in the E-Boutique section is luxurious and exclusive, each page of the website features trendy and stylish design. Its black and white general color scheme is masterfully created to point out the beauty of colorful images of jewellery items from the Bensimon collection. A detailed pop-up menu found at the top of the home page, informative Contact section, integrated online boutique, social networking widget and availability to browse the site choosing one of the languages offered, make the resource stand out of the crowd! Amoodz.com is an eCommerce website, which was professionally developed by Wix website builder. The site is created with regard to the contemporary web design ideas and trends. It has everything a visitor needs to get excited to keep browsing through the site and choose one of the most exclusive and luxurious pieces of jewellery a visitor needs. The design of the website looks quite simple, but elegant and stylish at the same time. The site is created in French, so, it’s not really convenient for an English-speaking visitor to browse through it. This, however, does not prevent the users from evaluating the jewelry collection of the website, which comes with high-quality photos and videos that demonstrate its exquisiteness. A nice example of an eCommerce website! 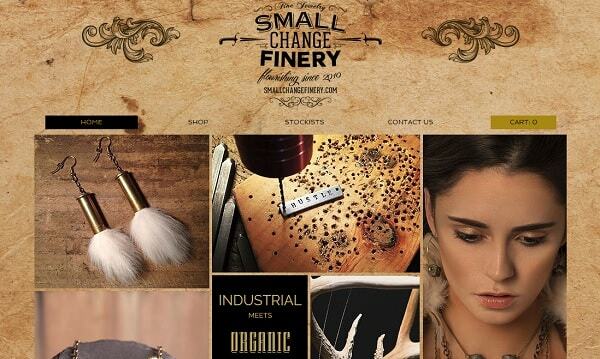 Smallchangefinery.com is an online shop, which is located in New Orleans and was created on the basis of Wix website builder. The website offers exclusive earrings, necklaces and bracelets for sale. The design of this eCommerce website corresponds to the ideas and messages of the online shop and features somewhat aggressive but attention-grabbing look. The light brown home page comes with high quality photos that demonstrate the beauty and authenticity of the items offered for sale here and has the Shop Now button, which encourages a visitor to keep browsing through the website. The integrated social networking widget allows the owners of the site to stay connected with their clients round the clock. 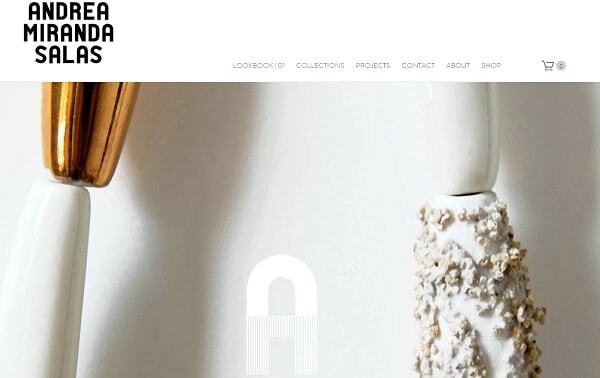 Andreamirandasalas.com is a website of the product designer of adornment and architectural objects based in Brooklyn, New York. She is passionate about materials, techniques and craftsmanship, which you can see from the very first look at her website. The signature feature of this website is the use of white spaces and high-quality images, allowing the content and the users’ eyes room to breathe. Another interesting element is a fixed navigation bar that scrolls down a page with you and allows for interaction when clicked. The only thing moving are the items that you can buy. Stylish and clean, this is one of the best example websites on the list. Founded by the mother and daughter, Jennifer and Morgan Keitt, lefayeproducts.com is a company dedicated to providing women with top quality products that simplify and enrich their daily routine. 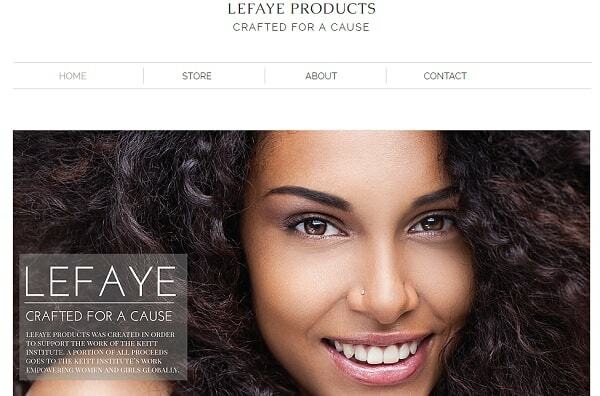 Although a black-and-white color pallet may seem overused, it appears to be a perfect fit for LeFaye Products. On one hand, it shows a certain amount of high class sense about their cosmetics and on the other, it also has a soothing effect on the visitors eyes. The sophisticated minimalist appearance helps to draw attention to the products on display and prompts to explore them in detail. The only thing I would improve is the assortment. I wish there were more items for the complete look of the catalog. If you’ve had a chance to follow the links and have a closer look at the example websites featured above, you should have a good idea of an extensive range of possibilities that Wix offers. The design options are really endless and each template can be changed beyond recognition. Everything will depend only on your preferences and aesthetic taste. Do you know other eCommerce websites built with Wix that are worth featuring? If you have one in mind, don’t hesitate to share it in the comments!